Snacks get a bad rap, especially when related to our kids. But not all snacks are bad. In fact, children need extra calories during the day to help with their growth and energy level. The key is to offer kids (and their parents) smart choices. Nutritionists have always recommended snacking on fresh and dried fruits, but how do you get kids to embrace this themselves? The good news is that the answer is not complicated. Studies show that kids are more likely to eat foods that they select themselves, so the best approach is to let them choose their own healthy snack. We recently developed a new display fixture, for use in grocery stores and school cafeterias, that directly addresses this idea. 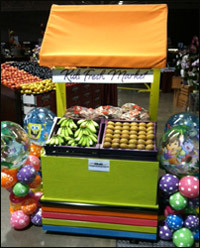 The simple goal of our “Kids Zone” merchandiser is to attract kids to healthy food by showcasing healthy snacks. As you can see here, the display is very lively and colorful to draw the attention of kids and incorporates signage to help parents notice it too. 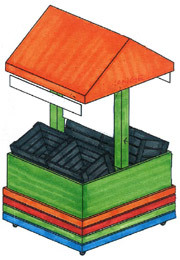 The interior wood crates can be filled with various fruits and vegetables and can quickly be changed out or re-stocked. There is also an attached coin cup for money, providing an “honor system” approach for parents and kids to purchase their snacks for a nominal charge. In addition to addressing the overall mission of improving kids health, this is also a savvy merchandising strategy: kids asking their parents to grocery shop at your store so they can visit the “Kids Zone” and pick out a (healthy) snack.